This album page provides links to galleries that display images of Corvida and Basal oscines from the order Passeriformes (Passerines) that I photographed in various habitats. In each photo album a gallery displays portraits of individual species that may include male, female, juvenile or immature birds and for some species, a supplementary gallery features behaviour such as hunting, nesting, feeding, and mating. Crows are almost cosmopolitan, found in most terrestrial habitats and form the core corvid group; Monarch-flycatchers are small to medium-sized oscines occupying woodland and forest habitats; Shrikes are small slender-bodied birds often seen in open or bushy habitat. 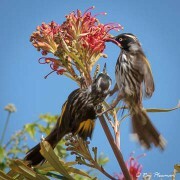 Drongos are medium-sized forest and woodland passerines with forked tails; Fantails are forest birds that have small-bodies and long tails; Australasian Robins1 are small stocky forest oscines; Birds-of-paradise are small to large rainforest passerines. 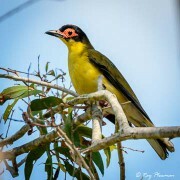 Old World Orioles are medium-sized forest, woodland, and parkland oscines; Whistlers are small to medium-sized birds that inhabit woodland and rainforests; Mohouas3: include three small-sized species that mainly inhabit New Zealand's native forest. Butcherbirds are small to medium-sized birds that have varied habitats including urban areas; Cuckooshrikesthese small to medium-sized oscines exploit most forest type habitats; Ioras are very-small passerines found in wooded areas including, parks and gardens. 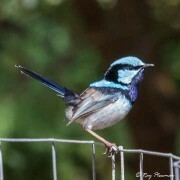 Are a large and diverse group of Australasian small to medium-sized bird species whose habitat includes forest, heathland, mangrove, urban and rural gardens. 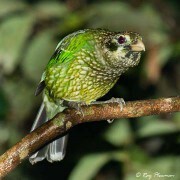 Displays images of these noisy nectarivores feeding on flowering plants and trees or perched singing or calling. Fairy-wrens6 are small to very-small insectivores with cocked tails found in variety of habitats including forests, grassland and shrubland; Thornbills7 are small to medium-sized birds whose habitats include forests, woodland and heath. 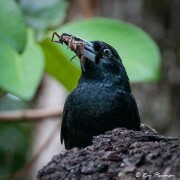 Are medium to large-sized omnivorous birds found primarily in wet-forests and rainforests. 1 Sibley and Ahlquist Taxonomy places Australasian Robins (Petroicidae) in Corvoidea while other taxonomists place them in basal Passerida. 2 Some modern taxonomic approaches elevate OW orioles and whistlers to superfamily Orioloidea while Sibley and Ahlquist Taxonomy places them in Corvoidea. 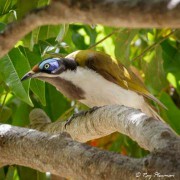 3 Sibley and Ahlquist Taxonomy places Mohouas (Mohouidae) in Corvoidea while other taxonomists have placed them in many different families, but usually in whistlers (Pachycephalidae). 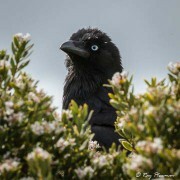 Modern approaches suggest they should be basal to core corvids being a sister group to Orioloidea and Malaconotoidea. 4 Sibley and Ahlquist Taxonomy places these families in Corvoidea while some modern approach elevates them to superfamily Malaconotoidea. 5 Sibley and Ahlquist Taxonomy place honeyeaters (Meliphagidae), fairy-wrens (Maluridae) and thornbills (Acanthizidae) in superfamily Meliphagoidea while the modern approach to taxonomy places them in basal oscines, parvorder Meliphagida. 6 The Australian Wrens (Maluridae) family comprises two sub families: Malurinae (fairy-wrens/emu-wrens) and Amytornithinae (grass-wrens). 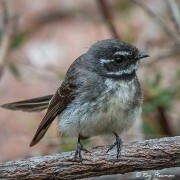 7 Under some modern approaches to taxonomy thornbills, scrubwrens and gerygones (Acanthizidae) have been merged with Pardalotes (Pardalotinae) renamed Gerygones and allies family. 8 Sibley and Ahlquist Taxonomy place bowerbirds (Ptilonorhynchidae) family in Superfamily Menuroidea part of parvorder Corvida while others place them in basal oscines, parvorder Climacterida.